I wanted to give a little “hommage” to this wonderful vegetable that seems to be unknown or almost unknown. Anytime I get to the cash register, either the cashier or the person in line behind me asks me about what those are, and how to cook them. This morning when I was asked “how do you eat them”? I responded “oh I cook them”, then I realized that was not the right answer. When winter comes, I get so excited because I find them in the store, (not sure why they’re only available in California in this time of year, in France and Italy they’re mainly available during spring time because in winter they tend to freeze if the temperatures are too low) as a matter of fact, that excitement was so high that I bought three of them yesterday and went back again today to buy two more! not a good idea since they are using all the bottom shelf of my refrigerator. Cardoni are very special to me, they remind me of my childhood and my grandfather who was the gardener in the family. He planted those in our garden and would always come home to distribute those beautiful vegetables for to the whole family. They’re mainly eaten in Italy, many French people don’t know what it is, or maybe in the South of France, they’re more popular. They look like a huge celeri but taste like artichokes, and are from the artichoke family. 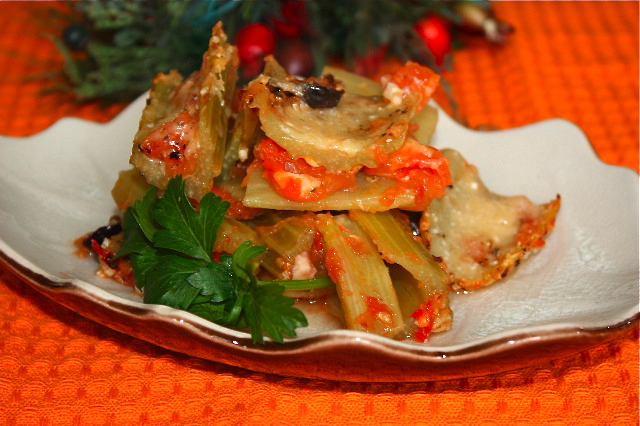 They have a very small calories per serving, are high in fibers and taste deliciously “artichoky”. My mom called them gobbi (which is the other Italian name), she used to prepare them with chunks of beef in umido along with potatoes. Umido is a cooking method that consists of cooking food at a very low temperature while adding some liquid to the dish. She used to put some tomato sauce and that was one of my favorite dish because of all the bread you could dip in the sauce. You can prepare them in a gratin style, or sauté or even with breadcrumbs, garlic, parsley and baked, or any way you like. This is a quite simple recipe but very flavorful and light, just a few ingredients are enough for cardoni. Detach from the heart each cardoni stem. Wash them and remove the leafy edges from top to bottom, like if you would peel them. Cut in about 2 inches chunks. In the meantime and while cardoni are cooking, prepare the tomato fondue. In a pan, heat olive oil, add crushed garlic, stir for a while to get the flavor out, then add tomatoes, salt and pepper. Cook at medium heat until the tomatoes start to become soft but not mushy. Add olives. Place cardoni in a baking tray, add tomato fondue and sprinkle with parmesan. Cook in a pre-heated oven at about 360F-370F for about 20-30 minutes or until the top has turned golden brown. Sprinkle with parsley and serve as a side dish or as a main vegetable dish. This entry was posted by silvia on November 10, 2009 at 10:23 pm, and is filed under Vegetables, Vegetarian - dairy. Follow any responses to this post through RSS 2.0.You can leave a response or trackback from your own site. I love cardoons. But I only ate them once. I ate them somewhere in Switzerland many years ago. They are a great vegetable. I honestly want this for breakfast looked fantastic! Great post! I love it when people give their personal connection to the ingredient or recipe. I hope I can find this, it sounds wonderful. I always learn something from your posts, I love it! 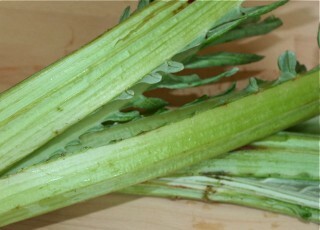 Is this the same as cardoon? I’ve never heard of cardoni, and I’m intrigued. Your dish is a beautiful use of this vegetable whatever it is. Is this the same as cardoon? I’ve never heard of cardoni, and I’m intrigued. Your dish is a beautiful use of this vegetable whatever it is! Ah yes, around that region – in the Savoie region, it’s a traditional Christmas dish ) maybe in Switzerland too! Seems like you have a “salty tooth” for breakfast!Thanks! I think the older you get, the more attached to memories you become. Thanks! hmm… never seen it in Melbourne but then again, maybe I need to look harder. Interesting! I’ve never actually eaten cardone, though I’ve seen them prepared. It’s nice to see a recipe for this very cool veggie. Now I know I’ll buy it next time I see it at the farmer’s market next year! 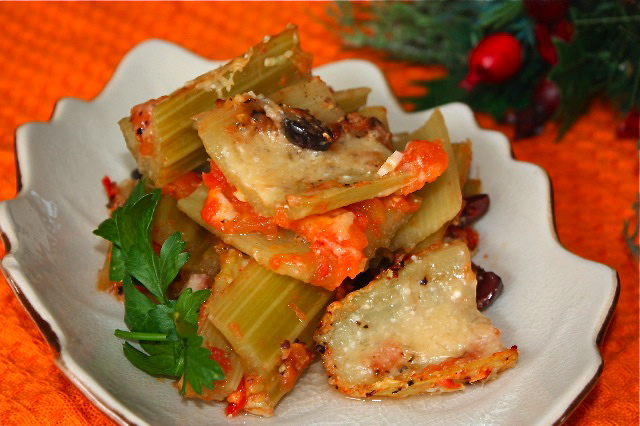 I love artichokes, but despise celery … This dish would scare me! Ha ha! I’ve never heard of cardoni, but i would love to try it! and congrats on perfecting American sarcasm with your response of “I cook them”. Hilarious! i have never seen or heard of cardoni until now, that looks really good! new name for me. If I see it, I would think it’s a new species of celery…haha. This dish looks so delicious and healthy. Did you mention low calories? Good for indulgence then ) I can eat that for breakfast, lunch and dinner! Mais cela semble très bon. Que j’aime cette assiette, elle est très jolie. What a great introduction to a new ingredient! I love the idea of an artichoke-tasting vegetable that has the sturdiness of celery. What a fun trick this would be to play on my mother — she’s never been a celery fan, but loves artichokes. I think she’d get a kick out of this! i’ve had cardoons at paula wolferts house but have never cooked them myself.this recipe looks great, maybe it’s time i tried em. Love Cardoon—but almost impossible to find in the stores here (unless you special order)~such a treat the day I spot some in the market. Wonderful Mediterranean flavors here. Yeah, exactly what I wanted to say! It looks like celery but it’s not celery! I don’t even know how artichoke was taste like! Just wanted to tell you tha I live in Bologna in Norther Italy and we have cardoons right now, they appeared about six weeks agao at the beginning of November. I love them! Thanks again! `I’m going to try this recipe this week!